On June 7, 1776 Virginia’s Richard Henry Lee stood up in the Second Continental Congress in Philadelphia and offered a resolution that would forever change the course of American and world history. The congressional response to the Lee resolution was to create three committees. The first was to draft a Declaration of Independence. The Second was to create an agreement for a government uniting the colonies. The third was to create a sample treaty for alliances and commerce with foreign countries. The North American colonies of the British Empire were about to embark upon a journey that had never been taken before. There was little guidance from history. 456 years earlier in 1320, the noblemen of Scotland had (19 earls and 39 barons) sent a letter to Pope John XXII, asking for relief from the rule of England’s King Edward and recognition of Robert the Bruce as King of Scotland. The Declaration of Abroath asked to terminate allegiance to the British crown, and replace it with allegiance to a different king. In 1581, the people of the Netherlands terminated their allegiance to Spain’s King Phillip. This was done with the Act of Abjuration. The argument was that Phillip had abandoned his kingly duties to the Netherlands and as a result he was owed no allegiance. The people of the Netherlands though, like the Scots 260 years earlier, were looking for a new king, and wound up with the Duke of Anjou, brother of the King of France. In 1688, England itself declared the English throne had been vacated by King James II. James actually had been chased out of the country by the Dutch army lead by the man who would become King William III. The 1688 English Declaration of Rights was employed to change kings in England, but set no precedent for independence from the British Empire. 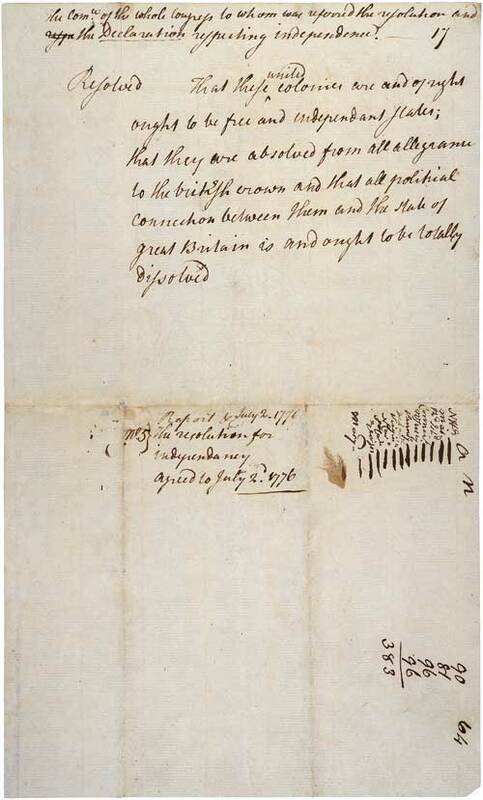 Richard Henry Lee’s June 7th resolution to the Continental Congress, proposed the American colonies do something that had never been done before in the history of the world. They would absolve themselves of allegiance to King George, but would not seek out a new king. They would govern themselves. While Congress continued to debate the resolution and colonial congressmen sought instructions regarding how to vote on Lee’s resolution a committee of five men set about preparing a congressional declaration in case the resolution were adopted. On June 11, 1776, Benjamin Franklin, John Adams, Thomas Jefferson, Roger Sherman and Robert Livingston were appointed to the committee. The final editing was completed on July 4, 1776, and that was the date on the copies printed by Philadelphia printer John Dunlap, the evening of July 4th. Ultimately that became recognized as the national birthday. From the 1215 Magna Carta, the 1320 Declaration of Abroath, the 1581 Act of Abjuration, to the 1688 Declaration of Rights, when subjects were dissatisfied with their “sovereign” or royal ruler, the solution had been to make a deal with the current ruler or find a new one. The standard for a government was an empire principally controlled by a royal family. The American Declaration of Independence changed this, not just for America, but for the world. 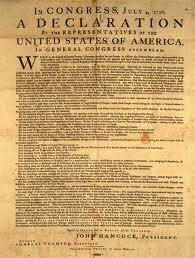 There had never been a Declaration like that made in 1776. In 1790, the people of the province of Flanders declared they were independent of the Austrian Emperor Joseph II. The successful slave revolt in Haiti was accompanied by a Declaration of Independence from France on January 1, 1804. There are now 195 countries in the world. More than 100 of them came into being with the issuance of a document whose heritage can be traced to the Declaration of Independence. There was no precedent for the action of Second Continental Congress. There was no precedent to begin a country based upon the Laws of Nature and of Nature’s God. The successful revolution of the United States, announced by its Declaration of Independence, became a precedent for the world. Learn more of how this document came to be with my book Creating the Declaration of Independence. It takes you into the minds of Richard Henry Lee, John Adams and Thomas Jefferson in the weeks before July 4, 1776. You will experience Lee’s trepidation as he knows when he proposes American Independence to the Second Continental Congress that he is literally risking beheading. Join Adams and Jefferson at City Tavern as they begin crafting the Declaration and follow the story of how Jefferson came to reluctantly draft the Declaration when few others, including Adams thought that Jefferson’s assignment was important. You’ll even learn a shortcut Jefferson used to craft a document of such immortality on short notice and how that short cut affects the work of the Supreme Court today. 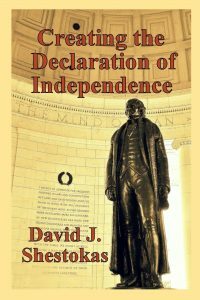 Creating the Declaration of Independence is available on Amazon in print and Kindle editions.